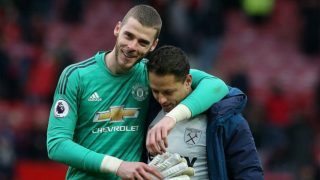 Javier Hernandez returned to Old Trafford on Saturday as Manchester United beat West Ham 2-1. The former United striker failed to make an impact on the game and was replaced by Michail Antonio with just over 15 minutes remaining. When announced that Chicharito would be substituted by Manuel Pellegrini, the home support gave the Mexican a standing ovation, fondly remembering his five-years at Old Trafford. Hernandez won two Premier League titles during his time at the club. Responding to the standing ovation, Hernandez used Instagram to thank United fans for their support and wished the club the best for the future.